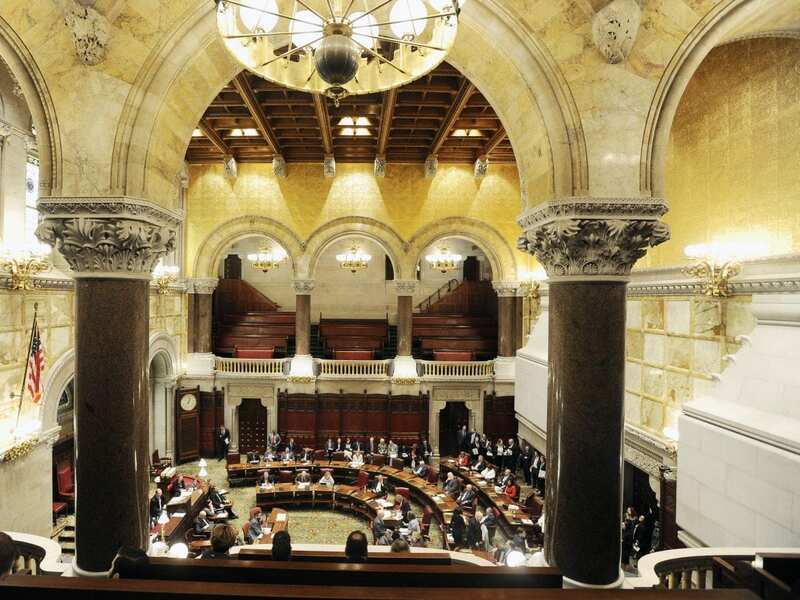 New York state's Senate is considering a bill that would permit authorities to prosecute someone under state law even if the person had been pardoned by the president for violation of federal law. New York lawmakers will carry on trying to close a loophole that could shield people from state prosecution if they have received a presidential pardon — without the bill’s high-profile champion, former state Attorney General Eric Schneiderman. Schneiderman stepped down late Monday in a whirlwind scandal over his alleged mistreatment of women, revealed by an explosive report in The New Yorker. He denied the substance of the charges but said they would prevent him from effectively doing his work. Schneiderman’s departure from the public scene removes a longtime nemesis of Donald Trump, one whose latest project targeting the president remains unfinished: Last month, Schneiderman announced that his office had concluded that New York law might protect from state prosecution someone who has received a presidential pardon for federal crimes. The issue isn’t with Trump’s constitutional pardon power, which is broad, but with New York’s criminal law, Schneiderman opined. So he asked the Legislature in Albany to amend the law and close what he called this loophole. State Sen. Todd Kaminsky, a Democrat who represents southern Long Island, says those efforts will continue. He introduced legislation that comports with Schneiderman’s request and said he still intends to help it through the legislative process. “Closing the pardon loophole is essential to allowing New York to enforce its own laws, and to ensure justice is done—it must be passed,” Kaminsky told NPR in a statement. The effort in Albany is intended to ensure that a pardon from Trump does not absolve people in Trump world from prosecution if authorities in New York opt to try to charge them with crimes under state law. Trump, his former campaign chairman Paul Manafort, his personal attorney Michael Cohen and others have New York City businesses, real estate or other connections. Kaminsky’s bill remains in committee and would need to pass the state Senate and state Assembly before it could be presented to New York Gov. Andrew Cuomo, a Democrat.